When I was in my early 20's I loved the look of acrylic/gel nails (not too long thou), and with the job I was doing at the time my nails needed to look perfect. I had gel nails for about two years and when I made the decision to have them removed - mainly down to the cost of how much it was to look after them. My real nails were a state, they were thin, peeled and couldn't grow. At the time I used some rescue treatments from America that seemed to do the trick. Since then I can't go a day without colour on my nails and they seemed to get to a certain length and start to peel and split. Not very nice and also means I am forever painting my nails. 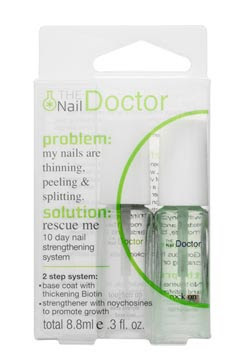 So when looking in Boots for a miracle cure I came across 'The Nail Doctor', this is a brand I have never come across before or even heard of so I thought I would give it a go. I liked the sound of the 'Rescue Me' which is a 10 day treatment. So I am giving it a go and really hope that it makes a difference and my nails stop peeling. I was thinking about putting a photo up to show how bad my nails are, but have decided that I wouldn't put you all through that. Are there any great treatments that you know of and like? oh goodness, i need this! love the blog! cant wait to start following and catching up with your posts! Love it! I really need to try false nails, because I use nailpolish all the time and my nails are seriously damaged :s So sorry I can't give you advice, but I hope the treatment works out for you!! I've heard there are gelatin pills you can take .. I don't know how accurate that is ?? ?